Sleep apnea is highly treatable. The effective treatment of sleep apnea begins with the screening visit. This is the most common type of sleep apnea and is caused by complete or partial obstructions of the upper airway. With OSA, the diaphragm and chest muscles work harder to open the obstructed airway and pull air into the lungs. It can reduce the flow of oxygen to vital organs and cause irregular rhythms. Continuous Positive Airway Pressure (CPAP) Therapy. CPAP therapy involves using a machine to gently blow pressurized air through your airway continuously, which keeps the throat open. Surgery. Excess tissue in the throat can be removed to make the airway larger. This may involve removal of the tonsils, adenoids, and uvula. Oral airway appliances. A custom oral appliance is created and worn at night, which works to move the jaw forward thereby increasing the size of the airway. There are two types of oral appliances, the Jaw Advancing Device (JAD) and the Mandibular Advancement Device (MAD). 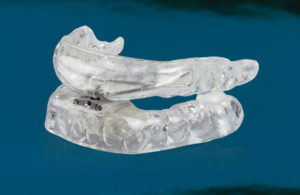 These oral appliances work to treat sleep apnea and are effective at stopping snoring.